The rally was arranged in response to a local “March Against Sharia,” which was one of over two dozen demonstrations organized nationwide by ACT for America. They have long sought to spread fear of Islam by using the unrealistic threat of Sharia law to justify discrimination and hatred, and was designated an anti-Muslim hate group by the Southern Poverty Law Center. 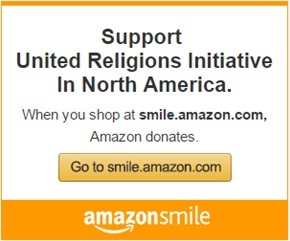 In recent weeks, Chance has been working on launching ING’s Know Your Neighbor (KYN): Multifaith Encounters Summer Campaign, of which United Religions Initiative in North America is a campaign partner. They chose this weekend to set it in motion, strategically launching their Summer Campaign before the anti-Sharia rallies as a way to send a positive message instead of a divisive one. The campaign has resources that promote education and conversations across different divides to help foster greater understanding across faith traditions. The rally Chance participated in is one example of how the few dozen protesters across the U.S. with “March Against Sharia” were met by hundreds of counter-protesters in support of Muslim community. 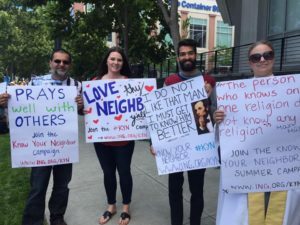 While the Islamic Networks Group chose to rally for love, other groups across the country chose a different approach — showing love and community through family-focused activities. With the anti-Sharia march in Syracuse, New York, coinciding with InterFaith Works’ Annual Duck Race to End Racism, the agency saw it as the perfect opportunity to broaden the event’s impact. Instead of going to where the protestors were, the Duck Race provided a space for positive community building. InterFaith Works, a Cooperation Circle member of the United Religions Initiative, organized an “Ask A Muslim” booth at the event to encourage conversation. They invited Muslim volunteers to answer questions about Islam and handed out thousands of pamphlets with information about Ramadan. Additionally, the opening blessing for the day’s activities was done by the Imam of The Islamic Society of Central New York, and statements were made by governor of New York Andrew Guomo and the mayor of Syracuse Stephanie Miner. The event attracted more than 3,000 people, twice as many people as they had seen at the Duck Race each of the previous 14 years. In Phoenix, the rapid response team at Arizona Faith Network, which is a Cooperation Circle member of the United Religions Initiative, also chose to host an event to counter the March Against Sharia planned in their city. After talking about possible ways to counter the hate, they settled on breaking bread together as the perfect way to foster community. 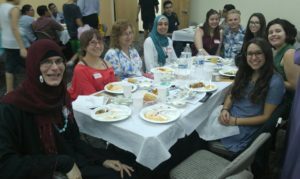 Members of the Arizona Faith Network joined in iftars, the evening meal with which Muslims end their daily Ramadan fast at sunset, in both Tempe and Scottsdale, Ariz. An invitation to join the iftars was sent via email blast. For those not familiar with the Muslim tradition, information was shared about how to dress respectfully, that they might be asked to remove their shoes, and about the importance breaking fast together. A video was also shown explaining Ramadan and the purpose of fasting. “One of the women in the video was talking about how you don’t realize how important things are until they’re gone,” Executive Director at Arizona Faith Network Erin Tamayo said. While the woman in the video was talking about food and drinks, which Muslims abstain from between sunrise and sunset during Ramadan, it made Tamayo think of something else.